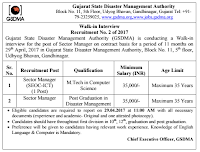 Gujarat State Disaster Management Authority (GSDMA) has been published Advertisement for below mentioned Various Posts 2017. Check below for more details like age limit, educational qualification, selection process, application fee and how to apply. Candidates should have throughout first division in 10th, 12th, graduation and post graduation. 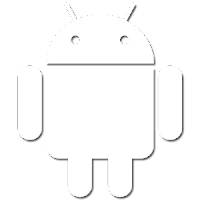 Preference will be given to candidates having relevant work experience. Knowledge of English Language & Computer is Mandatory. 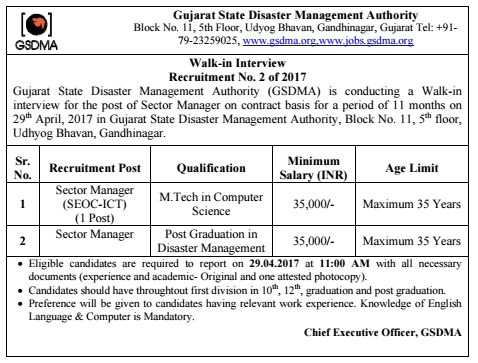 Venue: Gujarat State Disaster Management Authority, Block No. 11, 5th floor, Udyog Bhavan, Gandhinagar.  Walk-in-Interview: 29-04-2017 at 01:00 p.m.